PULP COVER FRIDAY GOES ALL WEIRD! 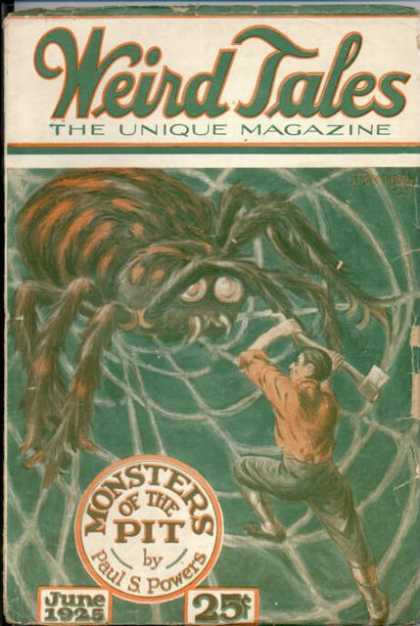 We’ve featured a couple of magazines so far, but I realized that though I’ve spotlighted a Weird Tales cover or two, I’ve never devoted a whole column to my favorite pulp zine. As I was scrolling through the covers, there were too many great ones for a single column, so, good news!, I’m going to devote this post to some prime WT covers from the 1920’s, and then cover the 1930’s and the 1940’s in subsequent weeks. 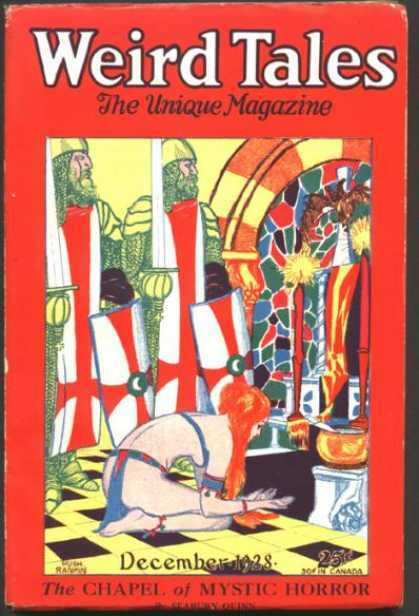 Let’s begin with the cover from the very first issue of my favorite pulp magazine of all time (3-23). “Ooze.” Beat that for a title for a WT story. Though in these early issues WT was still feeling its way (there were a lot of stories about faux haunted houses and other Scooby Doo tropes) this was a quite decent story about a giant amoeba running amuck. This was an incredible issue (May-July, 1924) which is incredibly scarce today. A huge bedsheet-sized zine, the cover combines a number of my favorite things: ancient Egypt, Houdini, and H. P. Lovecraft. HPL, you say? 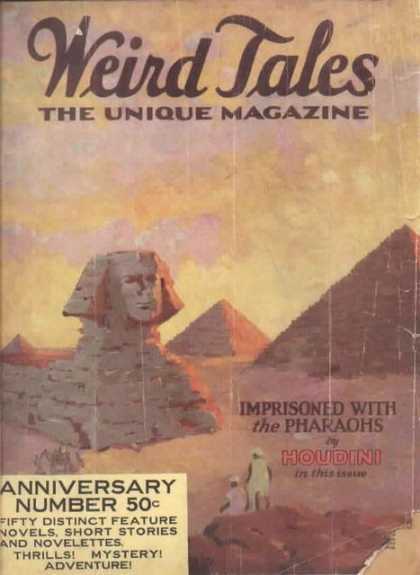 Well, the cover story, “Imprisoned with the Pharaohs” didn’t write itself, and neither did Houdini. It was ghost-written by HPL and represents, I believe, his first WT cover story. While not one of the old gent’s best stories, it is a pretty wild tale about nefarious goings on inside the pyramids, and reveals what the Sphinx really was. As you might guess, it was fairly eldritch. Because, who doesn’t like Big Bugs? (6-25). H.P. Lovecraft was not the most pouplar writer in WT. Neither was Robert E. Howard, Clark Ashton Smith, or even Nictzin Dyalhis (probably because no one could spell his name correctly; in fact, I’ve tried three times and I’m not sure I’ve gotten it right yet). 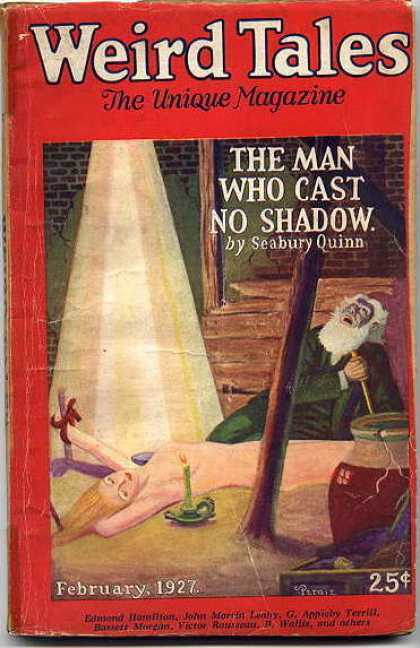 No, that honor went to Seabury Quinn, mostly because of his long-running series about the French occult detective, Jules de Grandin. Jules is all right, but, in my estimation, Quinn belongs in the second rank of pulp writers, which actually is not bad. I suspect that one of the reasons for Quinn’s popularity was a certain kinkyness to many of his stories, as illusrated below (2-27). 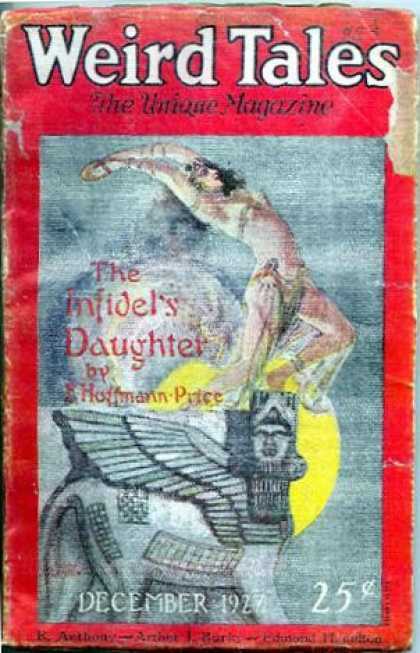 Here’s an interesting cover for a E. Hoffman Price story (12-27). 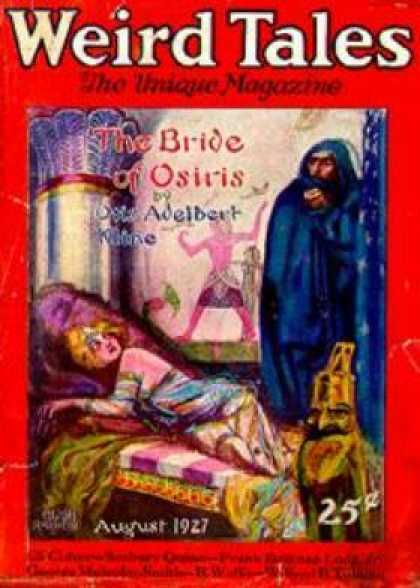 Almost forgotten today, Price wrote a number of colorful tales set in exotic locales through-out the world. Like Quinn, I would put him in the second tier of pulp writers, but, again, that ain’t bad. You can usually depend on him if you’re looking for top-notch adventure in weird settings. All right, not all WT stories are classics. 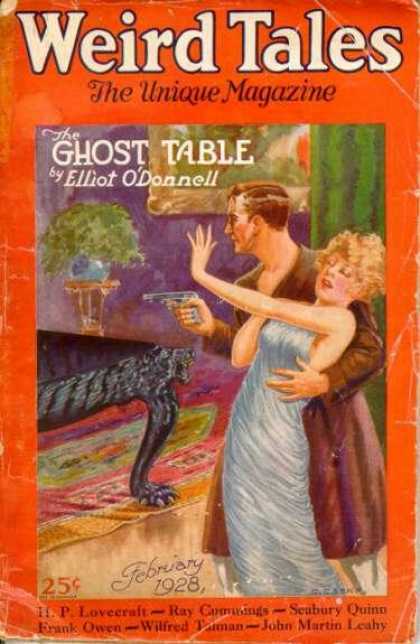 I’ve read this one (1-28), and it’s about as exciting as you’d expect a story about a haunted piece of furniture to be. IE, not very. Howard’s second (I believe) WT cover story (8-28). Not bad, but th eonlyone to do his stories justice was Margaret Brundage (and even she could never get the hero right). This is a Solomon Kane story. Another Seabury Quinn story (12-28). See what I mean? 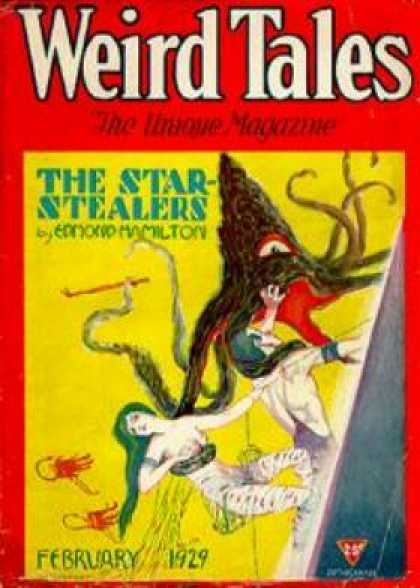 Love this cover to a Edmond Hamilton story (2-29). Hamilton had a long career in the pulps, from the dim days of their beginnings, through the 1960s. He specialized in cosmic adventure, but he wrote all kinds of stories, and was a good, solid writer, though not the best in his family. His wife was Leigh Brackett. Story by, guess who? I didn’t realize that electric tape had been invented that early on (6-29). 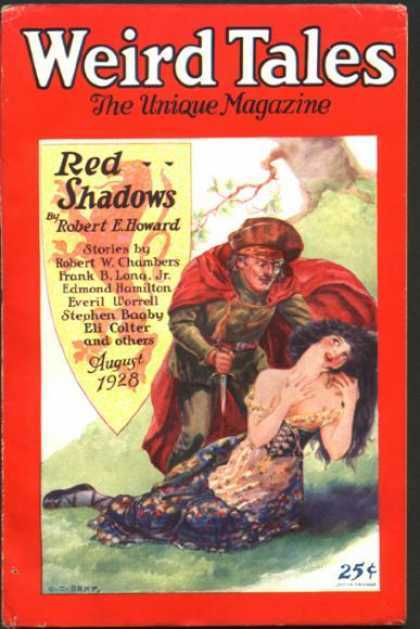 This cover illustrating a Gaston Leroux story rounds out our survey of Weird Tales in the 1920’s. Next time I’ll take up the 1930s with another baker’s dozen or so covers. Also, I promise more movie reviews, soon. They’ve been piling up. And I’m sure everyone (at least those of you who haven’t forgotten it) is on tenterhooks about the battle of the Hounds. Also, more prizes, soon, I promise. Long-suffering cheese-heads deserve more free swag.